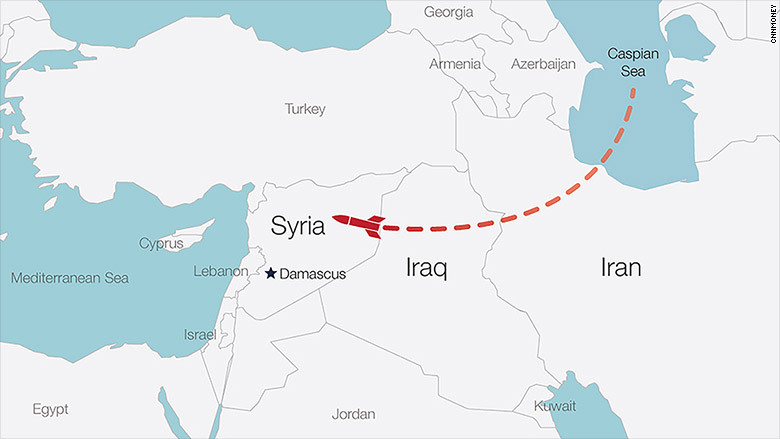 Airlines flying over the Middle East have been warned about the risk of missiles being fired from the Caspian Sea into Syria. Airlines have been warned of the risks posed by low-flying missiles over Iran and Iraq. The European Aviation Safety Agency alerted all European-based carriers about the danger after missiles were fired from Russian warships in the Caspian Sea on Oct. 6 and Oct. 7. The missiles landed in Syria. The agency did not make any recommendations about whether pilots should revise their routes, and said the missiles were launched well below the airspace where commercial carriers usually fly. Air France (AFLYY) quickly responded by introducing temporary rules for flights heading over Iran and the Caspian Sea, though it wouldn't provide details about the new measures. The airline already avoids flying over Syria, Iraq, Yemen, east Ukraine and Libya. British Airways said it would adjust its flight plans based on advice from the British government, security agencies and aviation organizations. "We would never fly in airspace unless we were satisfied that it was safe to do so," a spokesperson said. Related: How safe are European airlines? The high-level warning will undoubtedly make some fliers nervous by raising concerns that a missile could hit a commercial airliner. This scenario played out in July 2014 when a passenger plane broke up over Ukraine. U.S. officials concluded that Malaysia Airlines flight MH17 was struck by a missile and shot out of the sky. A final report from Dutch investigators is set to be released Tuesday. An early draft of the report indicated that pro-Russian rebels were responsible for shooting down MH17 and killing all 298 people on board. The European agency sends out these kinds of safety bulletins on a regular basis when it has concerns about anything from anti-freeze to plane parts. The warning was not sent directly to U.S. and other non-European carriers, but would have been re-circulated via agencies like the Federal Aviation Administration.